Health insurance costs are up for 2016. Monthly premiums for the most popular plans offered on Affordable Care Act state exchanges in 2016 are 10.1 percent higher on average than they were in 2015, according to the Kaiser Family Foundation. The tax penalty for those without health insurance is also set to increase in 2016 from $325 per adult or 2 percent of household income to $695 or 2.5 percent of household income, reported the The New York Times. GOBankingRates conducted a study of popular health plans offered on ACA exchanges in each state and the District of Columbia to see which states' residents are paying less for health insurance and what they're getting for their money. Click through to see if your state is among the best or worst for health insurance costs. To find the states with the highest costs, GOBankingRates compared the lowest-cost plan at the ACA's silver tier in each state. Comparing monthly premiums, deductibles and copays based on a single, 40-year-old, non-smoking male with an annual income of $40,000, the study highlighted the 10 states with the highest health insurance costs. If you live in one of these states, you should expect to pay more each month for your insurance. Unfortunately, you'll also be paying more for each doctor or emergency room visit, as the worst plans charge higher co-insurance rates and copays. Starting with the 10th-worst to the No. 1 worst state for health insurance costs, these are the states where residents pay more for coverage. Colorado residents enrolled in the state's cheapest silver plan, the CO Silver 2750 option from Kaiser Permanente, will pay a $266 monthly premium that's right in line with the national median. The deductible is also relatively reasonable at $2,750. This plan's unfavorable co-insurance charges put Colorado in the bottom 10 of this list. A 20 percent co-insurance charge will apply for all visits to a primary physician as well as for emergency care, which means that the policyholder might still face high out-of-pocket costs even after they've met the deductible. The lowest-cost silver plan offered in Wyoming, BlueSelect Silver ValueTwo, carries a premium of $315 a month, 18.4 percent more than the national median of $266 for this type of plan, as found by this study. That's with a substantial tax credit of $105 a month, without which the premium is $420. The plan has an average deductible of just $3,000, but plan participants pay co-insurance charges at 20 percent even after the deductible is met, meaning costs could be high for people who require healthcare services more frequently. Wyoming residents and legislators are currently debating whether to expand Medicaid in the state under Obamacare, which would bring the state $268 million in additional funding over two years and enable it to help approximately 20,000 uninsured residents get coverage. Wyoming Gov. Matt Mead expressed support for the expansion, reported the Wyoming Tribune Eagle. The lowest-cost silver health insurance plan offered on the ACA exchange in Delaware is the Health Savings Embedded Blue EPO 3400 plan from Highmark Blue Cross Blue Shield Delaware. Priced at $320 a month after tax credits ($3,840 annually), it costs well above the $266 national median identified by the survey and has a higher-than-median deductible of $3,400; however, the plan offers 100 percent coverage after this deductible is met. These costs are higher than this state's residents paid last year. Delaware's ACA exchange premiums rose 22.1 percent on average for 2016 compared with insurance costs for 2015 plans, according to DelawareOnline.com. Deductibles and out-of-pocket costs also rose year over year. Similarly, Delaware state employees might be facing higher health insurance costs or lowered benefits due to a spending gap anticipated in 2017, reported Delaware Public Media. The number of Indiana residents enrolled in insurance plans through the ACA marketplace doubled in 2015 to close to 180,000, reported The Journal Gazette, and the state expanded its Medicaid through the ACA in 2015. Despite these changes, Indiana still has some of the highest health insurance costs in the nation. The lowest-cost silver plan, the MDWise Marketplace Silver Basic, costs $3,432 a year with its higher-than-average monthly premium of $286. The plan also has a high deductible of $5,000, and even after the deductible is met, the policyholder can expect a $200 copay for urgent or emergency care visits. Out-of-pocket costs are capped at $6,600. The cheapest silver health insurance plan offered to Oklahoma residents, Blue Advantage Silver PPO 103, has a monthly premium of $283, totaling $3,396 annually. This cost is higher than the median, and the plan's high deductible of $4,000 and higher copays, such as $15 per visit to a primary doctor and 20 percent co-insurance even after the deductible is met, contribute to making this one of the most expensive plans in this study. The plan's out-of-pocket maximum is $6,850. Insurance options offered to Oklahomans through the ACA exchange are more limited for 2016, down from five providers to just two -- and one of the remaining insurers has further limited its offerings in the past year, reported local outlet NewsOK. With fewer choices, Oklahoma insurance shoppers have fewer chances to get a deal on health insurance in 2016. Mississippi's lowest-cost silver plan, Ambetter Balanced Care 2 from Magnolia Health, is $278 per month, or $3,336 annually. It's the plan's high deductibles, however, that make it one of the most expensive. The insured party under this plan needs to meet a deductible of $6,500, the second-highest deductible cost of the health plans surveyed in this study, and each visit to a primary doctor has a copay of $30. Mississippi also has the worst health system of any state, according to a 2015 study on state health system performance by the CommonWealth Fund. The state had the third-worst score for accessible and affordable healthcare, largely due to its high rates of uninsured adults and failure to expand Medicaid. As the state with the highest poverty rate of nearly a quarter of its residents -- 24.3 percent, according to The Stanford Center on Poverty and Inequality -- health insurance is still outside the financial reach of many Mississippians. New Jersey's lowest-cost silver plan, Oscar Market Silver, landed among the worst in the U.S. because of its high co-insurance costs of 50 percent. While it has a lower-than-average deductible of $2,500, a plan participant will still be responsible for half of the healthcare costs after this deductible is met. Additionally, the plan's monthly premium of $317, or $3,804 annually, is higher than average. The combination of a high monthly premium, high deductible and high copays make Alabama the third-worst state for health insurance costs. The state's lowest-cost silver plan, the Silver Compass 5000 plan offered by UnitedHealthcare, has a high deductible of $5,000, after which the enrollee is still responsible for 20 percent of care costs and a $20 copay for primary doctor visits. These lackluster benefits come at an above-median cost of $288 a month, or $3,456 a year. The state has not opted to expand Medicaid. In November 2015, a task force appointed by Gov. Robert Bentley recommended that the state government work to extend coverage to the hundreds of thousands of Alabamans who currently earn too much to qualify for Medicaid but don't make enough to reasonably afford health insurance, according to AL.com. Opting into a federally funded expansion of Medicaid could help the state's low-income residents get better access to healthcare. In South Carolina, the cheapest silver plan is the Blue Option Silver 6850 offered by BlueChoice HealthPlan, which ranked as the second-costliest because of its $6,850 deductible, the highest of any silver plan in this study. This high deductible is the plan's maximum out-of-pocket cost, and no co-insurance is required once this is met; however, a primary care doctor visit will incur a $25 copay. People in South Carolina also get poorer quality healthcare, according to CommonWealth Fund's study of state health systems, which ranked South Carolina in 40th place. The study reported that South Carolina is among the worst states for accessible and affordable care, has less equitable healthcare and is home to residents with overall poorer health and lifestyles. New York has the most expensive health insurance, with factors scoring poorly across the board. The state's cheapest silver plan, offered by CareConnect, has a higher $3,000 deductible and the highest monthly premium at $366 ($4,392 annually). The insured party will pay some co-insurance charges, such as 25 percent on emergency care. The plan's maximum out-of-pocket costs are capped at $6,850 per individual. Although New York is featured here for its high costs, it made healthcare news in late December 2015 when Gov. Andrew Cuomo signed a bill that adds pregnancy as a qualifying event, which enables pregnant women to enroll in an insurance plan at any time, including outside of typical enrollment periods. With this law, New York is the first and only state that requires health insurers to accept pregnant women as new policyholders at any time. In the study of states' health insurance plans, some plans stood out as offering higher value while charging lower premiums -- the lowest is less than half of the cost of the most expensive health plan identified in this study. Lower premiums enable plan participants to save money in their monthly budgets, and lower deductibles and copays mean residents of these 10 states are also more likely to pay less when they need to use their insurance. Click through to see the 10 states where health insurance providers give customers better deals. Idaho is one of the worst states for accessible and affordable healthcare, with 22 percent of people experiencing high out-of-pocket costs relative to income and rates of uninsured adults remaining high near 20 percent, according to data from the Commonwealth Fund. Because the state has opted not to expand Medicaid through federal funding, the state also has 78,000 residents who have incomes too high to qualify for subsidies or Medicaid but too low to afford monthly premiums, reported the Associated Press. Idaho's Gov. C. L. Otter, however, has introduced a new $30 million legislative plan that would use state funds to address the issue. The good news for Idaho residents is that their health insurance costs are already relatively low. The lowest-cost silver plan in the state, Mountain Health Co-Op Link Silver, has a monthly premium of $266, which is the national median, and it has a lower deductible of $2,150. Flat fees for visits to emergency rooms and primary doctors also keep costs low. Several new healthcare laws went into effect Jan. 1, 2016, in Oregon that expand many residents' insurance coverage. The provisions require health insurance providers serving Oregon residents to cover a full year of birth control, 90 days' worth of most prescription medicines, and medical services provided via videoconference, reported Portland Business Journal. Despite the expansions to health insurance coverage for Oregonians in 2016, the costs are still some of the lowest in the nation. Silver plans start at $230 a month with the Connect 2000 Silver plan from Providence Health Plan. Its deductible is a low $2,000. Plan participants should expect to be responsible for some of the costs beyond the deductible, however; emergency services carry a $250 copay after the deductible is met, and the copay for care from a primary doctor is $25, with out-of-pocket costs capped at $6,850. Despite having one of the nations' highest costs of living, Hawaii's health insurance costs are some of the most reasonable. Along with one of the better low-cost silver plans, Hawaii also has one of the best health systems in the nation, ranked as the third best in the nation by the CommonWealth Fund's study. The state's lowest-cost silver plan, HMSA Silver HMO, has a monthly premium of $260, which is slightly better than the $266 median, and it has a relatively low deductible of $2,500. It also charges flat copays for emergency care and visits to primary physicians, which help to limit plan holders' costs when they need to use their insurance. The District of Columbia has some of the best health insurance costs. The District's cheapest silver plan, BlueChoice HMO HSA Silver, has a monthly premium of $229, or $2,748 annually. The deductible is just $1,350 -- one of the lowest of any of the plans reviewed for this study -- which also helps limit out-of-pocket costs for policyholders, such as the $300 emergency room copay. Michigan is another state with low a monthly premium -- just $210 a month, or $2,520 annually. The low-cost silver plan with this premium, Humana Silver 3800/Detroit HMOx, does have a $3,800 deductible, however, which is higher than most states' silver plan deductibles, but costs are kept low with other fees, such as the $20 primary doctor visit fee and the $250 emergency room copay before deductible. These low costs are offset somewhat by Michigan's 0.75 percent tax on health insurance, which funds Medicaid coverage for low-income residents of the state. Even with this tax, however, health insurance is relatively affordable in Michigan, and 311,000 state residents have signed up for health plans through the ACA exchange since Nov. 1, 2015, according to the Associated Press. Competition between Pennsylvania's 19 health insurers selling individual plans on the ACA exchange has led to better prices and plans for residents. The state's lowest-cost silver plan from Independence Blue Cross, for example, has one of the lowest deductibles in this study: $1,500. This deductible, paired with flat copays that make it easier to predict and control costs, are the top factors that put Pennsylvania at No. 5 among states with the lowest health insurance costs, even with the plan's monthly premium of $276. Health insurance plans offered on the healthcare exchange in Texas are some of the best in the nation. The state's cheapest silver plan, Molina Marketplace Choice Silver Plan, offers a low $2,000 deductible with a competitive $253 monthly premium for an annual premium total of $3,036. Flat fees on health services also reduce the overall cost. Despite its low healthcare costs, Texas still has some catching up to do. Texas is one of the most populous states that opted not to expand Medicaid, according to the Kaiser Family Foundation, and although its uninsured rates have dropped since ACA took effect, 20.8 percent of residents were still without insurance in the first half of 2015, according to Gallup data -- the highest of any state. In the nation's most populous state, more than 238,000 California residents joined the Covered California health exchange, reported The Orange County Register. The state's cheapest silver plan, Silver 70, costs $360 less a year than the national median because of its lower $236 monthly premium. The plan also has other affordable features, such as a low $2,250 deductible and flat fees on many health services. These low costs might soon be increased by a tax on all health insurance plans proposed by California Gov. Jerry Brown, according to the San Jose Mercury News. The tax would raise an estimated $1.35 billion each year, which Gov. Brown hopes to use to expand programs and services such as those for Californians with developmental disabilities. For Utah residents, low-cost health insurance is within reach even though the state has not adopted the federal Medicaid expansion. The state's least expensive silver plan, Molina Marketplace Silver Plan, has a premium of just $214 a month ($2,568 annually). Utah residents on this plan can also look forward to more affordable out-of-pocket costs. The plan has a low $2,000 deductible and flat fees for many health services. It also caps out-of-pocket expenses at $6,850. With the lowest monthly premium for a silver plan of any state, New Mexico residents can get covered for just $181 a month, or $2,172 annually, on the Molina Marktplace Silver Plan. Along with a low premium, this plan also offers a low $2,000 deductible and flat-fee copays for many health services. Despite low costs, many New Mexico residents have encountered issues getting their health coverage. Due to a high volume of health insurance applications, many applications submitted in December 2015 remained unprocessed even past the date when insurance coverage should have kicked in, reported the Santa Fe New Mexican. Enrollees whose applications weren't processed quickly enough experienced problems such as being unable to visit a doctor or receive care using their new policy. Here is the full ranking of the 50 states and the District of Columbia from best to worst, according to their health insurance costs for the silver plan with the lowest monthly premium in each state. Methodology: This study compared silver plans with the lowest monthly premiums offered through the national or state-level insurance exchanges administered through the Affordable Care Act. Silver plans were used because these are the most popular plans, accounting for two-thirds of plans purchased through exchanges, according to data from the Department of Health and Human Services. Costs were estimated based on the following assumptions: The insurance enrollee is male, single, 40 years old, doesn't smoke, is in good health, earns $40,000 a year and lives in a major metropolitan area in the state. Where the enrollee qualified for a tax credit, the costs cited in the study reflect the estimated deduction that would apply. The lowest-cost silver plans for each state were ranked based on the favorability of four cost factors: (1) the plan's monthly premium, (2) deductible, (3) emergency care copay and (4) copay for care from a primary physician. This study and the included rankings were updated Jan. 21, 2016, to correct an error in calculating the cost for a Vermont silver health insurance plan. The ranking for the states with the highest health insurance costs has been updated to reflect this change, with Vermont moving out of the top 10 and Colorado moving up to No. 10. 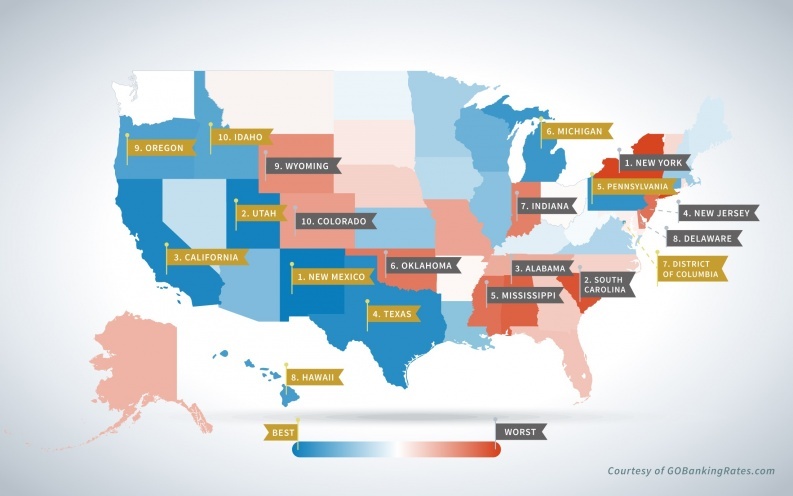 This article, 10 Best and Worst States for Health Insurance Costs, originally appeared on GOBankingRates.com.